At first glance, there’s no doubting that this is a powerful sports cruiser with striking good looks. But the real attraction lies in its large, open cockpit that features a U-shaped seating and dining area. And if a refreshing dip in the water is called for, you can enjoy all the benefits of a large bathing platform that features a hydraulic hi-lo system. Moving through this sociable boat you will find a generously proportioned indoor seating area where you can simply open the retractable hardtop roof and direct the large side windows to gently drop down to create a wonderful alfresco environment, with the perfectly appointed galley being very much part of this enjoyable space. Below, you will find the stunning full-width master cabin and beautifully presented en suite. More akin to a boutique hotel room, they are both spacious and inviting. Each guest cabin also converts to a double and wherever you find yourself on the boat, when the going gets hot, you can all enjoy the refreshing benefits of chilled water air conditioning. Trades Considered. 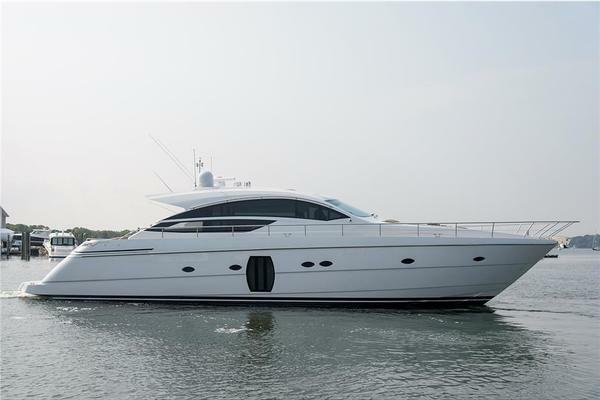 United Yacht Sales New Jersey would love to guide you through a personal showing of this 58' Fairline 58 Gt 2012. This yacht for sale is located in Singapore and priced at $1,059,000. For a showing please contact us by filling out the form on this page and we will get back to you shortly! Vessels is equipped with every option to include Salon Sunroof and automaticPowered cockpit sunshade, cockpit stowage chest / bench seat, teak cockpit table with electric sunbed conversion, cockpit bar pack: Bar unit with griddle icemaker and bin, safe with digital keypad to master cabin, timber venetian blinds to all cabins, skylight to master cabin, dishwasher to galley, extra fridge/freezer to lower lobby, and so much more.